I have written about this topic multiple times before (within the Mental Health Avoiding Liability Bulletin) and I will likely write about it again. The name given to such practice has changed within and among states, and telemedicine, telehealth, and telepsychology have all been used. The topic is broad and there are many aspects of online or e-therapy that can be discussed. One of the aspects that I have previously written about involves practicing online with patients or clients that reside (at the time of treatment) outside of the state where the practitioner is licensed to practice. Unless the practitioner is licensed by the state in which the patient resides, an issue arises as to the legality of the treatment. State licensing boards (including licensing boards for physicians), charged with the duty to protect the public (in a particular state), have generally taken the view that treatment occurs in the state where the patient is located at the time that the services are rendered. More specifically, there has been a concern that the practitioner in such situations is not licensed in the state where the patient resides (and is present when receiving treatment), and thus may be subject to a charge of practicing without a license in that state, which is usually a crime (misdemeanor). Such a narrow view of interstate practice will in the long run change (and is changing), and some state licensing authorities and professional associations are addressing interstate practice issues. I believe that some state medical boards are (or will be) addressing this issue by granting a special or limited credential to physicians who will provide telemedicine services in a state where the patient receives treatment and where the physician is not licensed to practice medicine. Certain minimum requirements would have to first be met in order to obtain the credential. Similarly, there is movement in this direction by the psychology profession. The American Psychological Association (Council of Representatives) has recently approved telepsychology practice guidelines. This followed the earlier establishment of an inter-organizational task force, consisting of representatives from APA, the APA Insurance Trust, and the Board of Directors of the Association of State and Provincial Psychology Boards (ASPPB), to develop and address regulatory concerns and liability issues involved with the practice of telepsychology across jurisdictional boundaries. ASPPB has established a separate telepsychology task force whose primary task has been to consider the issue of the regulation of telepsychology practice. The task force has developed a concept referred to as the “E. Passport,” which is aimed at establishing standards that would ultimately allow psychologists to lawfully practice (online) in a state where they are not licensed as a psychologist and where the patient resides – a special credential allowing the practice of telepsychology across state or other jurisdictional boundaries. With respect to the telepsychology practice guidelines referred to above, they address such areas as informed consent, confidentiality, competence of the practitioner to perform telepsychology, and interjurisdictional practice. These guidelines are not at the present time binding on psychologists, but they may form the basis for a binding regulatory scheme as time progresses. The guideline dealing with interjurisdictional practice states that psychologists are encouraged to be familiar with and comply with all relevant laws and regulations when providing telepsychology services to clients/patients across jurisdictional and international borders. Some states have enacted statutes that address/regulate online therapy (a/k/a telehealth, telemedicine, the use of telecommunication technologies when performing therapy). Issues such as informed consent to receive services electronically and remotely may be addressed in statute, and may require that specific elements be included. It is important to remember, as stated above, that if you are considered to be practicing online therapy without a license in a state (where the patient resides) other than your state of licensure and practice, this may constitute a crime. 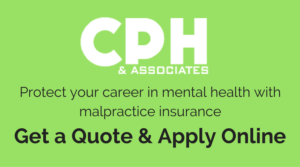 Malpractice insurance will generally not provide coverage for acts that are criminal – practicing without a license in the state where the patient resides. Of course, if the various states develop something similar to the medical profession, which appears to be the case for the psychology profession (the “E-Passport” idea), and assuming that the practice of online psychology (or psychotherapy) across state lines becomes legal, the malpractice insurer would be expected to defend and indemnify for covered acts (e.g., errors and omissions, negligence) since the practitioner was at the time engaging in the lawful practice of the particular profession. The California Board of Psychology has posted information on its website related to online telepsychology. The information is meant to be educative and informative for both consumers and psychologists. It is important to note that the information posted is not a formal recommendation by the Board of Psychology, but rather, it is information derived from a published work where the authors surveyed state Attorneys General on the issue of state regulation of telepsychology. My reaction when I read the content was to wonder whether these same cautionary suggestions for online psychotherapy don’t or shouldn’t also apply to traditional psychotherapy. For example, among the information provided are such statements as a) before engaging in the remote delivery of mental health services via electronic means, practitioners should carefully assess their competence to offer the particular services … b) a careful statement on the limitations of confidentiality should be developed and provided to clients at the start of the professional relationship, c) practitioners are advised to seek consultation from colleagues and to provide all clients with clear written guidelines regarding planned emergency practice (e.g., suicide risk situations), and d) clinicians should thoroughly inform clients of what they can expect in terms of services offered, unavailable services (e.g., emergency or psychopharmacology coverage), access to the practitioner, emergency coverage, and similar issues. Are not these suggestions applicable, at least to a large extent, to traditional therapy as well? I raise this question because, in my view, it is important to make sure, as online therapy laws or regulations are developed, that there not be an overreaction to this emerging form of practice. Moreover, when regulations are being developed or bills introduced, the following question may prove useful to ask: should these laws or regulations, or similar ones, be made applicable to the treatment of all clients, regardless of whether the therapy is delivered via the Internet or in the more traditional way? Care must be taken to avoid unnecessary regulation or overly intrusive regulation by the state.